Leukocyte recruitment and activation play a central role in host defense in response to infection or tissue injury. Leukocyte migration into inflamed areas involves a multistep interaction of leukocytes and endothelial cells via regulated expression of surface adhesion molecules and their counter-receptors on leukocytes and endothelial cells.1,2To prevent over-exuberant inflammatory response and damage to the host, leukocyte recruitment is tightly regulated. Conversely, failure of the host to resolve ongoing inflammation culminates in tissue destruction and remodeling, key events in the pathogenesis of a variety of diseases. 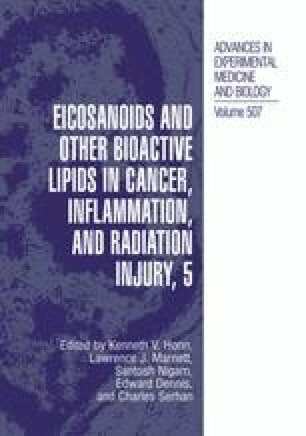 The host mediators serving as endogenous anti-inflammatory signals are only recently being appreciated.3Among lipid mediators, lipoxins (trihydroxytetraene-containing eicosanoids) represent a unique class with potent anti-inflammatory actions.3Lipoxins are produced from arachidonate by the combined actions of 5-lipoxygease and 12- or 15-lipoxygenase (for review see reference 4). Aspirin also triggers the production of 15-epimer of LXA4.5One lipoxin in particular, LXA4, controls leukocyte responses via its own G-protein-coupled receptor4which also engages 15-epi-LXA4. LXA4 and its stable analogs were found to inhibit neutrophil (PMN) chemotaxis,b7P-selectin-dependent adhesion and rolling on the mesenteric endothelium8transmigration across epithelial and endothelial monolayers9,10and entry into inflamed renal tissues.11In this study, we investigated whether stable analogs of native LXA4 and aspirin-triggered 15-epi-LXA4 are active within the microenvironment of human whole blood, and studied the cellular mechanisms that account for their novel inhibitory actions in leukocyte trafficking.